Tired of sticky, gross pads?? 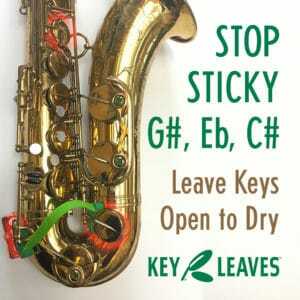 Visit Key Leaves and never have a problem again! Scott Robinson is a saxophonist and multi-instrumentalist that has been making waves in jazz and beyond for quite sometime now. Scott is releasing his brand new album, Tenormore, on April 5th and we caught up this week to talk about this and so much more. Robinson is well known for his playing on the more non-traditional saxophones including the bass and contra-bass horns but in this episode we talk about how tenor is really the center of his universe. Scott is a singular voice in the music world and really has a lot to teach us about going with your instincts and forging your own path when it comes to being a musician. Why Scott is excited to present his new album, Tenormore, to you on April 5th. 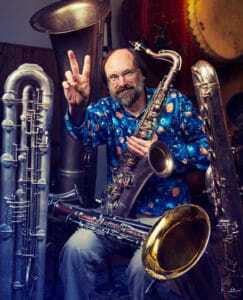 How he got started with the lower range of the saxophone family and what those horns mean to him. 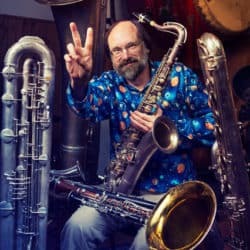 Why Scott thinks the bass saxophone is a ‘big fuzzy tenor’ and how he has broken this horn out of it’s traditional role. The one class that Scott taught at Berklee and why the tenor tradition is so important to him. The many projects that he has on tap for this year and beyond. Check out Scott’s website HERE! Grab Scott’s new record, Tenormore! Share this content with your favorite people!